The tenth year war is coming . . .
Carrie Welles has survived more attacks than she can count, but each one has made her stronger. She refuses to be a victim anymore. While her nemesis, Sharley, continues to be a threat, she works with Harris and the Aurora team to protect the future, vowing to raise her children and fight as the soldier-mother she was destined to be. Saul Harris has had visions of the Zeta ships hitting Earth years before they’re due, but has no proof to warn the UNF. Scraping together a small contingent of Alpha units, he prepares for the onslaught as best he can. He embraces his gift and ‘connection’ with Welles and they dig further into his ancestry, only to have more haunting truths come to light. As the invasion approaches, the new Aurora team members must find their place in the crew, while old team members reunite. They must band together with the Originals and their fellow Space and Earth Duty troops if they are to defend Earth against this attack. But is it too little too late? Have Harris and Carrie done enough to protect their future? As they fight for survival against the Zetas in a battle that stretches across the UNF Space Zone, they soon realise the price of their freedom might be higher than they were expecting to pay. I received an ARC! (Squeee!!!!) And sent it to my Kindle and opened it up. I admired the great cover balancing the hope of the upturned dishes with the darkness and the night sky and the ominous bold title font I've come to see as the series brand. Then I put it away for three whole days. A few reasons. I didn't want it to rush to that place of waiting for the next and being unable to read it again for the first time. Also, this series has frequently torn my heart out, tossed it on the road and stomped on it, occasionally leaving it there to be run over in traffic and lit on fire, before tenderly making it whole and slipping it back in my chest. I know what will happen, I'll read headlong into catastrophe and I want to, for sure, I just wanted the anticipation to build. For this series, I'm a literary thrill seeking danger junkie. It's become an Event with a capital 'E.' Some books I read because I'd be reading something anyway. I read Aurora because of the emotions. Aurora: Decima did not let me down. 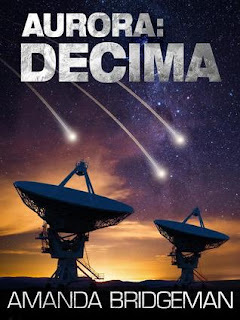 Decima rushes fast forward through a decade in time to the early arrival of a Zeta invasion and focuses on what the Aurora series does best - character and action driven science fiction. With book six in the series, Bridgeman took her foundation of characters and their relationships to the next level. They grew from well developed to complex and where the action went (and there's a lot,) I felt the added intensity of my attachment to Aurora's crew. Additionally, I've noticed the growth in Bridgeman's writing has been used to full advantage in handling the growing complexity of her plots. In Darwin, book one, there was a bluntness to her prose. Her writing felt a touch gritty and rough around the edges which was perfect for the calculated violence which introduced the darker scifi side consistent through the series. I experienced emptiness, foreboding and failure as she pulled us through, sometimes with not much more than a brittle sense of safety to catch our breath and step in to the next chapter. While Bridgeman's voice held fast through Pegasus, Meridian, Centralis and Eden and contrasted the growing connections and sense of family among Aurora's crew with danger and those very dark sub-plots, she added a delightful smoothness to her prose. Decima is by far the most ambitious in the series in terms of number of characters, places, subplots and time and holds together beautifully. I found myself dug into a story I knew would sting me (that whole heart thing) and was rewarded when it did. Favourite scene? The make-up argument. I went back and re-read it three times. Also re-read the big battle at the end. I continue to love and recommend this series. At time of review publication, you can start the series with Aurora: Darwin here with a copy direct to your inbox. You can also read my review of Aurora: Darwin here.